That’s what I thought, too, before I stumbled upon the magic of Maui Jim. It was just over two years ago when I walked into my eye doctor’s office and fell in love with these blue-mirrored beauties. I giggled as a tried them on. They felt so much better than the lost-and-found pair I had worn into the office, and the trendy aviator style flattered my face. I sighed as I returned them to the shelf. I was sure I couldn’t be trusted with a high-quality pair of “grown up” glasses, and besides, I didn’t need a prescription. As it turns out, none of that matters. Gone are the days of “ugly but effective” sun protection. When it comes to sunglasses, the options are infinite. Not only can you protect your vision long-term by investing in a quality pair, you can completely customize the design to suit your lifestyle and fashion sense. Mirror coating – It’s a common misconception that a mirrored finish means the lenses are polarized. Not true. 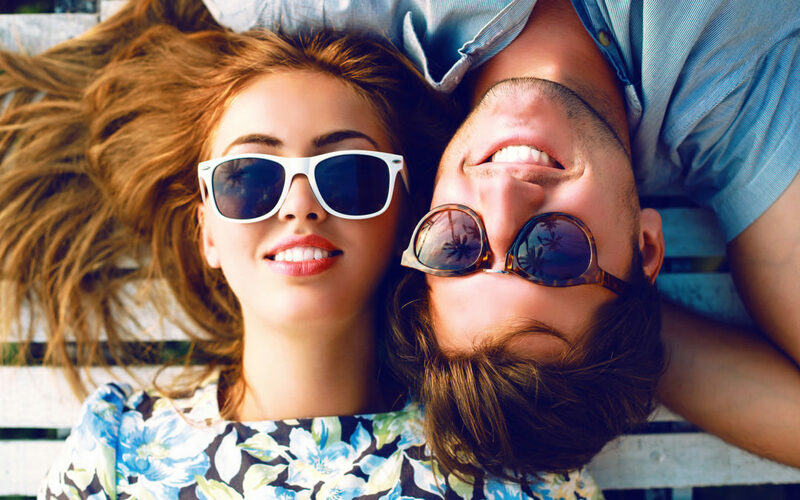 Polarization and tint are completely separate components in a good pair of sunglasses. However, a mirror coating does reduce the amount of light that gets through the lens to your eye. This makes the style especially popular among those who ski and enjoy other snowy sports. If you’re a fan of this reflective look, you’ll be pleased to learn that mirrored lenses come in a variety of colors, depending on the brand. If you’re wondering, the tone of the mirror is a matter of preference; it will not affect the way your eyes see color in the world. Polarized lenses – this is a comfort choice. Polarization of light is a complex phenomenon; quite simply, squiggly rays of light straighten when they bounce off flat surfaces like water, snow and ice. Our eyes see this as ‘glare.’ Polarized lenses use technology to block these straighter rays of light so that we can see more clearly. That’s why fishermen love polarized lenses – they can see past the sun’s glare and into the water. This technology isn’t for everyone, though. In fact, pilots can’t wear polarized lenses while flying because they interfere with the ability to read aircraft gauges. We offer custom-order sunglasses with prescription lenses (or not), impact-resistant and safety-rated polycarbonate wraparound style frames, and (of course) a rainbow of colors, lens shapes and sizes. For those of us who have short arms, there are even sunglasses with ‘reader’ magnification toward the bottom of the lens. Whether you want sporty, trendy, masculine or feminine, there’s a combination that’s just right for you and the life you lead. Stop in to our eyewear gallery and let our trained opticians help you select the perfect pair. Summer is right around the corner, and life is too short to live without shades you love. I’m wearing mine right now.